Credit for many of the photos and video clips goes to the families of the children. Without their posts, we would have little awareness of the numerous hospital visits over the years, which were done quietly and without media coverage. 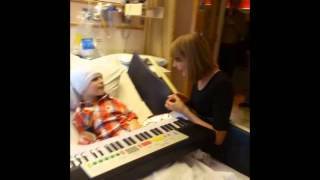 Taylor Swift released a hit single, “Ronan” to share the story of a small boy who lost his life to cancer during Childhood Cancer Awareness Month. Taylor Swift love her fans!! Taylor Swift Crashes Young Fan's Portrait Session—Adorable Poses and All!